“Asterix” is a comic book series comprising 36 volumes published over almost 60 years. The title character’s adventures have sold more than 300 million comic books and been translated into many languages (including, amusingly given the title character is often depicted fighting Romans, Latin). A national survey in France in 1969 indicated that two-thirds of the population of that country had read at least one of the Asterix comic books. As at the time of writer Rene Goscinny’s death in 1977, total sales in France of the comic book are said to have amounted to more than 55 million copies. “Parc Asterix” is a theme park in Paris based on the character’s adventures, and France has produced postage stamps featuring Asterix and his friends. Such is the title character revered in France that the first French space satellite, launched in 1965, was named “Asterix” in his honour. It is hard to think of any equivalent comic book character, measured by national recognition and success, in any Anglophone country. Mr Goscinny and Mr Uderzo are described as having used Roman emperor Julius Caesar’s “Gallic Wars” as their “bible” for the historical accuracy of the series. 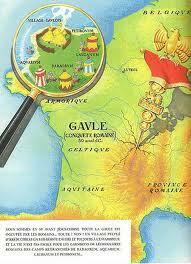 Asterix is depicted as living in a village in what is now Brittany, in around 50 BC. There has been informed speculation that the village is located in Erquy (Côtes d’Amor) The village is described as resisting Caesar’s conquest of Gaul (the region now comprising more or less modern day France). Some of that success of resistance to Roman rule is attributed in the comic to the magic potion brewed by the druid Getafix, which gave the village inhabitants temporary superhuman strength (and averting the need for Asterix to ever draw his sword). Some of the success is otherwise attributed to the Gauls’ plucky stamina. Plutarch was certaintly exaggerating, and is indeed famous for that. But the violence in the Gallic War must have been extreme. “Asterix”, with that historical backdrop, is reminiscent of the US television series “Hogan’s Heroes” (CBS, 1965-1971) in its depiction of Nazis as goofy and inept villains rather than genocidal butchers of the Third Reich: Caesar is not quite Colonel Klink, the bumbling Nazi camp commander of “Hogan’s Heroes”, but he is depicted as easily outwitted by the cunning Asterix. The reality is that Rome smashed the many tribes of the Gauls in this war, and left the dead and wounded of all ages and genders scattered like chaff across the countryside of ancient France. But the reality of the Roman occupation of Gaul after the war was however more nuanced. Roman governors and administrators were very likely to leave well alone the vast majority of the tribes in Gauls in its empire, and generally exercised considerable tolerance of religious beliefs, freedom of movement, customs and lifestyles. Disturbing the Gauls with unnecessary brutality after the war’s conclusion was not on the Roman agenda, and no doubt, if Plutarch is correct, the male population of Gaul’s tribes had been significantly diminished by the war. By 16 BC, Gaul was calm enough so as to be a staging platform for Roman invasions of Germania (modern day Germany). The etymology of the name Asterix has been explained by Mr Uderzo in interviews. Vercingetorix was the leader of the Gauls in a notable rebellion against Julius Caesar in the late 50s BC, the last of a series of battles which had occurred between Rome and various tribes from Gaul over the preceding 350 years and which included the sack of Rome in 390-387 BC by Celtic tribes from Gaul. Vercingetorix is described Caesar, in his “Gallic War”, as a Gallic nationalist. Upon his army being defeated by superior Roman soldiery at the Battle of Alesia, Vercingetorix surrenders to Caesar by laying down his arms at Caesar’s feet (repeatedly depicted in an amusing fashion in “Asterix” by Mr Uderzo as the defeated Gaul dropping various metal swords and weapons directly upon Caesar’s sandal-clad feet and thereby causing Caesar to yell in pain). Vercingetorix’s fate was grim, however: he was sent to Rome in chains and was executed in 46 BC. Vercingetorix’s name was the catalyst for the decision by the creative team during the comic’s development in 1956 that all of the Gauls in the comic should have a name ending in “ix”. This convention was followed in the English translation of the comic, although some of the names of major characters were significantly altered so as to be more accessible to an Anglophone audience: the tone-deaf village bard Assurancetourix (‘assurance tous risques’, or ‘comprehensive motor insurance’) is instead Cacofonix; the French dog Idéfix is Dogmatix. And so there is no historical foundation for the naming process of the characters, and certainly the names of Gauls generally did not end in “ix”. Other notable Gauls had names such as Bolgias, Cerethrius, and Acichorius – admittedly, Latinised versions of Gaullish names but which were very unlikely to have the suffix “ix”. Mr Uderzo has otherwise noted that as for “Asterix”, if the title commenced with the letter “A” then as a consequence of alphabetical organisation the comics would be placed first in the bookshop shelves and libraries. “Asterix” is not the name of any known Gaul in history, and instead is a reference to the character being the “star” of the title. In addition, the costumes worn by the characters (perhaps especially supporting character Obelix’s striped blue and white pants) have no correlation to what the Gauls wore in Roman times. 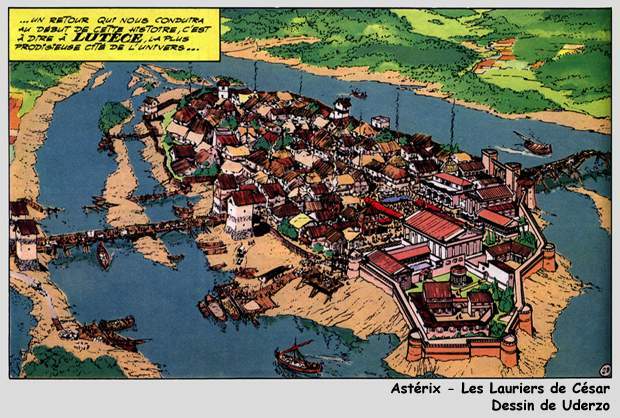 Paris (the Roman name was “Lutece” or “Lutetia” as translated into English) is sometimes depicted in Asterix as a village sitting on what is now Île de la Cité. It would be nice to think that ancient Paris did indeed resemble this depiction. The “Asterix” volumes are charming and entertaining books, but it is perhaps best not to rely upon them as faithful ancient history texts.